Sacramento is the state capital of California. It is located at the confluence of the Sacramento River and the American River in the northern portion of California's expansive Central Valley. Sacramento is a river town. Known as Sac, Sactown, Sacratomato, it is also called The City of Trees, with more tree per capita than any other city in the world. 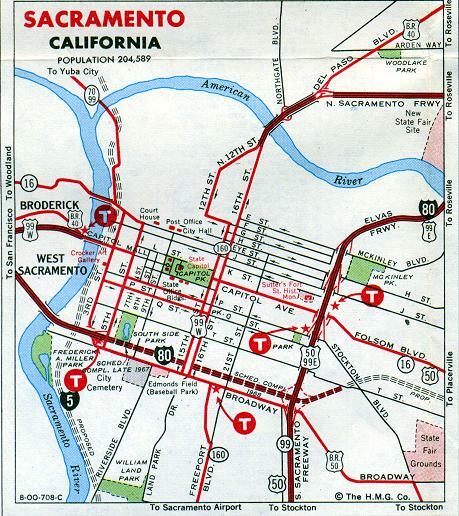 Sacramento is located on Interstate 80, midway between San Francisco and the eastern California border with Nevada. It is about 90 miles northeast of San Francisco and 383 miles north of Los Angeles. 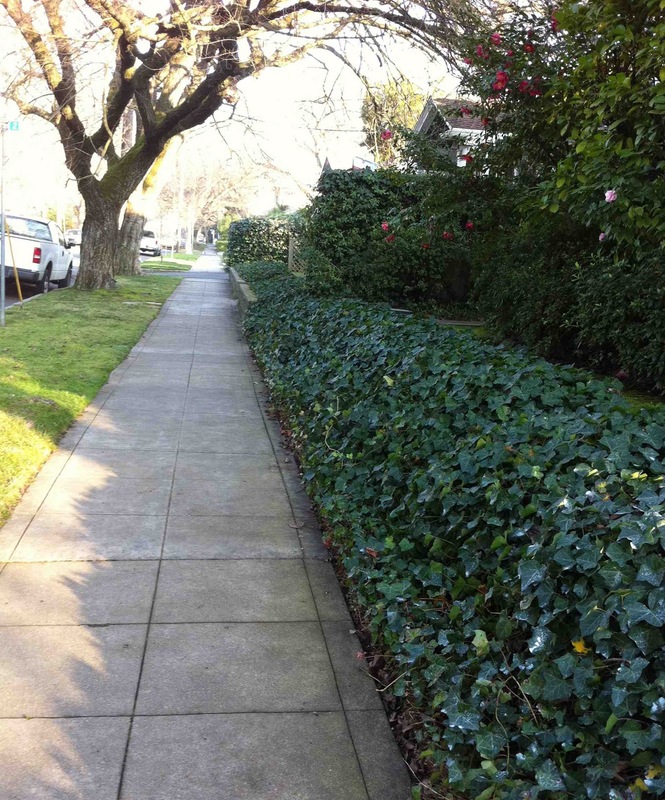 Other nearby communities include Parkway-South Sacramento, West Sacramento, East Yolo, Florin, Arden-Arcade, La Riviera, Rosemont and Rio Linda. Sacramento is a river town. It is also my home town. Sacramento is positioned 38.56 degrees north of the equator and 121.46 degrees west of the prime meridian. The amount of land area in Sacramento is 249.397 sq. kilometers. The amount of land area in Sacramento is 96.34 sq. miles. Sacramento elevation is 25 feet above sea level. 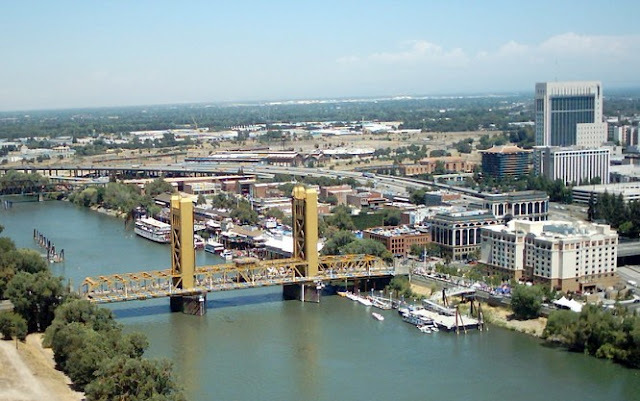 The climate for Sacramento is Mediterranean with mild winters and dry summers. There is usually low humidity in the area. Light rainfall usually falls between December and February. The average winter temperature is 53.5 degrees F.
The average spring temperature is 64.0 degrees F.
The average summer temperature is 88.0 degrees F.
The average fall temperature is 72 degrees F.
Sacramento was founded in 1849 and has been California's capital since 1854. The town was started by Captain John A. Sutter. He called it New Helvetia, a haven for his Swiss Countrymen. When gold was discovered in 1848, most of the workers left the town to hunt gold, leaving Sutter in ruins. He lost his fort in the aftermath. The Gold Rush of 1848 drew thousands to its borders and the population soared within months. Once the gold fever was gone, Sacramento was found to have more to offer its people than just gold. It became a center for trade in a greatly productive agricultural area. Sacramento is culturally diverse, home to a mix of races and cultures. This rich diversity has helped shape the distinctive culture of Sacramento. Along with thriving Caucasian and African-American populations, there is a a large Hispanic community including Mexicans, Mexican-Americans, as well as the newer flux of Russians, Vietnamese, Hmong, Chinese, and Pacific Islanders. Each subsequent wave of immigration adds an indelible flavor and color to the "River City." Being a "Sac-towner" has probably been the biggest influence on my way of dress. My love of retro, my preference for idiosyncratic dressing, my mix of blue-collar with art-house American is all very typical of a Sacramento denizen. We hold a strong love for personal expression, individualism and have a good tolerance of eccentricity. 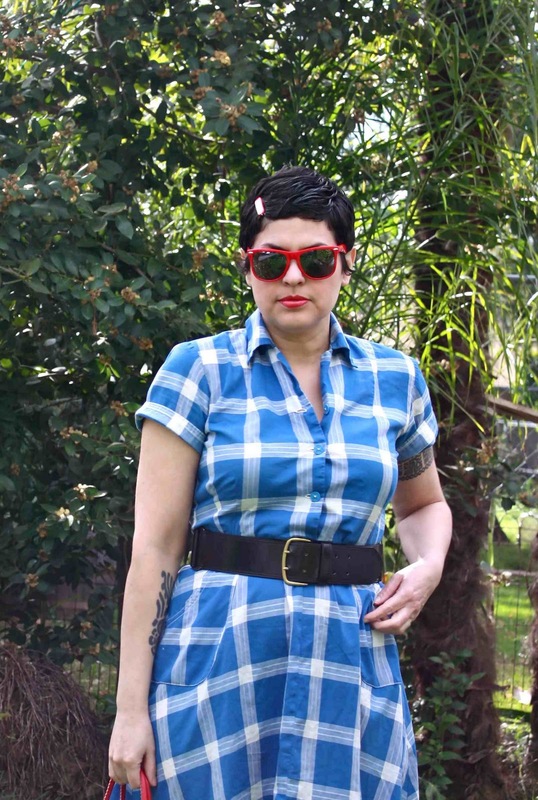 My scattered patch of tattoos, (and former piercings) are a very Sacramento thing, and there is hardly a self-respecting Midtowner who doesn't have an intense collection of vintage clothing or some articulated love of Craftsman or mid-century Modern. There is something inherent in the character of a Sacramento native that ties him/her to the past. Perhaps its our rich Wild West history, with our city roots deeply dug into its Gold Rush days, but it seems common that whatever the generation, a Sacramentan holds a nostalgic attachment to a previous time in history. For me, it's the 1960's, and for many of my generation it was 1950's rockabilly, 60's mod, and/or late '70's punk rock; for the new upstarts (the kids under 25) it's a perverse fondness for the 1980's replete with a love for acid brights, big hair, high waisted shorts and VHS tape collections. This has been a Full Time Fabulous community event. 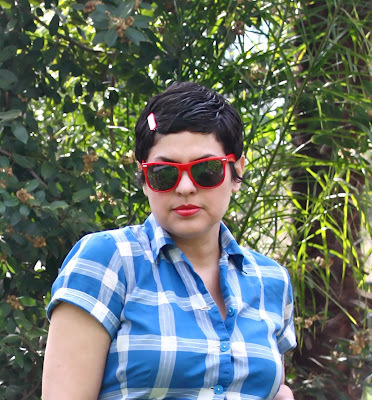 It is part of a group post organized by Kristy Elena of Sunglass Hut's Full Time Fabulous blog. The theme was "Contra Unus," which translate from the Latin meaning "on the other hand there is one,"and the intent was for our global Full Time Fabulous community to share our individual place, or heritage. For me, it is all about Sacramento. More Stats about Sacramento can be found here, and here and here. 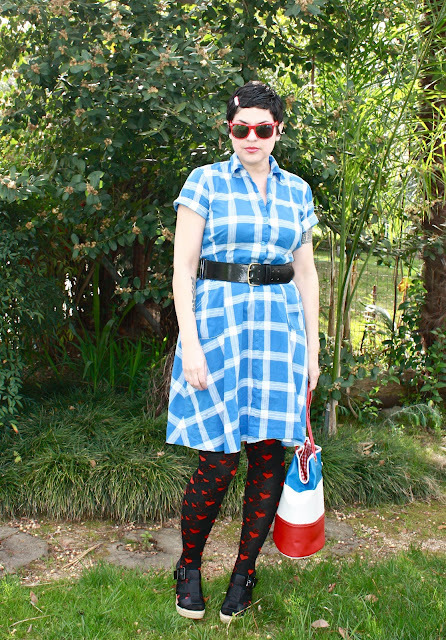 You look so lovely with your blue dress, heart tights and bag. Much love my dear Bella. Sacramento, I think you would fit right in here- I look forward in sharing my town with you! muchos beso! Just three reasons why I need to be in Sacramento, like, NOW. Thank you for introducing us to your city! Love this mix of prints, your hearts tights are gorgeous ! Bella, cool mixture of prints!!! I've been in Sacramento once back in '99 when I lived in San Diego. People were very cool and the weather was great! I've actually never been to Sacramento (I know, I know), though I have visited many other placed in CA. I really loved reading this post, and thanks to showing a map on here (I did the same thing, haha). If I was going to choose a home in the US Sacramento just might be it. Thank you so much for showing us your hometown, I love it, and I love you. And, you look bloody stunning! I love that first picture of you. You look endlessly cool...Thanks for the post about Sacramento. I haven't been there in a very long time. I love this story! I just learned something new, too. Funny that even though I wasn't born in CA, I love this state and what it offers so much. I think of you every Friday night when I drive through to S. Lake! Love that big bag, btw. I've been on the lookout and it my eye immediately went to it. Gonna check them out. Im going to Hawaii in June...we are planning the plane to choose....one choice is a layover in LA....who knows, we could meet afterall!!! Love that blue dress and what an interesting city you live in! Mine is a River city too - Right on the James!! East Coast meets West Coast! Voted for you BellaQ - best blogger! yay!! middle of the road!! I'm sure the Sottish band wasn't singing about our town, but it's a nice fantasy!! We have several of their albums and singles, the lead singer is a fox and she wears a Mr. Freedom jumpsuit to die for!! And for those that voted a big MUAH! xo. i knew you were in cali but didn't know it was sacramento. so nice to learn more about the city--i might want to move to california some day. your tights are awesome! My husband and I go to Sac-toe a couple times a year to watch baseball games. We always love it. So nice to read about your love for your hometown. I feel the same way for my hometown of Boston... but not in that crazed Red Sox fan kind of way. Thanks so much for sharing with us! Do people really call it Sacratomato?! For some reason I started giggling like a schoolgirl when I read that. I've never been to Sacramento but have always wanted to visit. One day I hope that vision of the 2 of us sipping lemonade on your front porch comes to pass! Thank you for sharing your hometown with us. It looks like a fascinating and beautiful city. plus, any place that results in the existence of YOU is on my must visit list! P.S. That first photo of you - super hot! My favourite part about Sacramento is the trees! I have never been but having the most trees per capita of any city is an amazing claim to fame! I really liked learning all about where you live. It sounds like an awesome place, and like I would fit right in. This makes me miss YC a little. I loved this post! I'm always fascinated with the idea of being born-and-raised in one city, experiencing all the important moments throughout life in the same place and how it must become a part of you. I can feel your pride and you perfectly illustrated just why you're so proud to call it home. So well done, and thank you. Off to go vote for you now, Sacratomato. That was just the best thing I heard all day. I think I literally lol'd. This was freakin' AWESOME bella!!!! first, i would just like to know that today's average temperate in new york was 50 degrees... over 3 degrees less than sacramento's average winter temperature. i love all the facts you posted and i love how explanation on how sacramento influences your way of dressing and personal style. that is always interesting for me to read because i love knowing how the places people live/have lived influences their fashion choices. 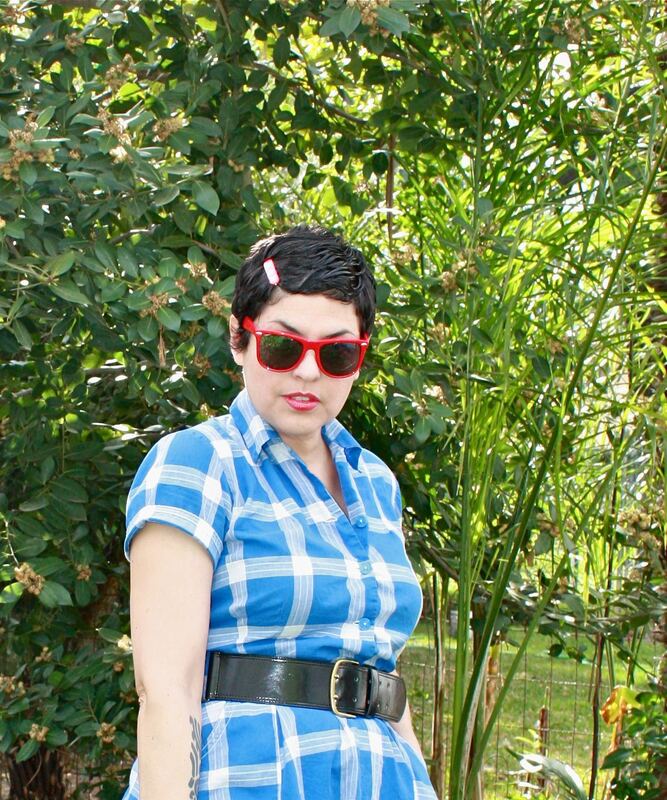 people often don't register how much location plays a role on fashion choices. Thanks for the tribute to Sacramento. The love for your community shines through you words. I loved finding out more about Sacramento and how it has influenced you! I must admit Northern California has been fascinating me recently, it seems like such a diverse place. I don't think I can afford to visit any time soon (soooo far away!) but I hope to one day! I was visiting my sister 2 years ago in san Francisco and I was mad to take a few days trip to Sacramanto and at the last minute we cancelled. Im so regretting it now... maybe next time! ps. me. want. those. friggin. awesome.tights. love how you share your city spirit with all of us, very inspiring! I like so much your plaid dress and your tights, an love the whole ensemble! I like where you are going with this :)You stay classy Sacramento. I have been going non-stop since my trip and when I got home my body was telling me to rest and it was much needed. Back at work now but would you believe I still feel like I am moving at times from being on the ship for almost 8 days. I didn't get sea sick at all when the ship moved it actually felt really relaxing. Your town looks and sounds lovely. I have been to LA but not had a visit to Sacramento. Love to visit one day. Your outfit is so cool. I have visited Sacramento! alas I was only 4 :( but I have always loved the name and for the name alone I would love to see it again, as an adult. ...and also for all the trees! Love the sassy ensemble! The colours, the patterns, bold, so kickass and gorgeously girlie! 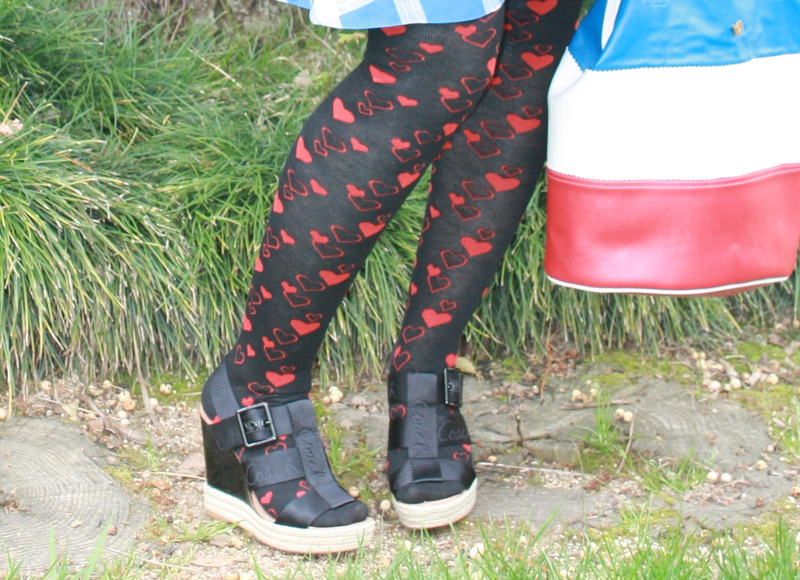 You are looking mighty fine today!Love the heart tights! Isn't Sacramento where Fleetwood Mac recorded Rumours? Great album. Great red sunglasses!! Never been to cali, but I'd love to go sometime in my life. Thanks for all the love, loves! I love those tights, that dress and my hometown Sactown! Wow, such a thoughtful post. I love how much you appreciate Sacramento. I can totally relate, I literally feel terribly sad when people don't like NY. Which is odd b/c I completely see why you might not like NY, but I just love this city so darn much I wished everyone could see it thru my eyes. I totally voted :)- you put so much care in making this post about your Sacramento you should definitely be its best blogger. So interesting re: gold rush impact. Love your post about Sacramento. I WILL get there one day! Nice post. But just a correction. The Asian community in Sactown is very old, in fact, the Chinese had a major existence in the city far earlier than the Hispanics. For the first few decades of Sacramento's existence, the city was primarily White with a large minority of Chinese.